It is one of the easy making recipes ...!!! 1) Wash moong dal with fresh water and soak for 5min . 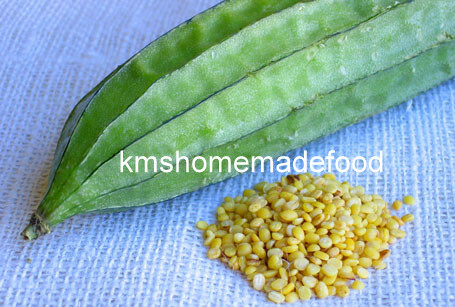 2) Remove skin of ridge gourd (peal out skin) and cut them into small pieces (while cutting taste one piece where it is good or not , some times it may have bitter taste that will spoil your original taste of recipe , avoid them from making recipe ) . Wash them with fresh water . 3) Heat oil in a pan , add mustard seeds chopped onion , add little salt , cook them for a while then add ginger garlic paste , curry leaves . 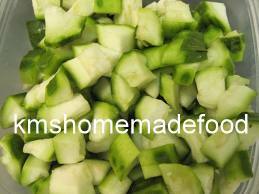 4) After a small break add ridge gourd , turmeric , red chili powder mix them very well and keep a lid on it for 2 min . 6) Finally add masala and coriander leaves mix it . 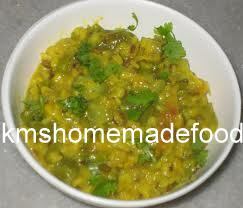 You have prepared Ridge Gourd with Moong dal recipe ....!! !